Not everyone is blessed with being a good cook, and many of us are time poor and looking for fast ways to feed the family. If one of your New Year resolutions was to lose weight, to eat healthier, or cook more from scratch, then it can be nice to have a few handy tricks up your sleeve in the kitchen that are quick and easy, but pack a punch of flavour. Why not give these three flavour infusions a go? Choose your favourite herb – you might try lemon thyme – just pulling off the small leaves from the stem, or rosemary – you could chop up or leave whole, or even mint keeping baby leaves in tact and chopping up larger leaves – there is no right or wrong here – do what takes your fancy. Place the herbs in a clean jar and top up with your favoured honey. Leave to infuse for around 5 days, to fully appreciate the flavour. If you don’t like honey, you could try similar with maple syrup. Don’t feel like you have to do large quantities, just vary the amount of honey and herbs until you get a flavour combination you really like. Then use on toast, on porridge, on pancakes – the taste combinations are endless! As with the others select a clean jar, and fill with your choice of vinegar – you might try a red wine vinegar, a balsamic vinegar or apple cider. Then complement the choice with your selection of dried or fresh herbs, citrus peels and so on. As a word of caution the darker or more syrupy vinegars may take on less flavour. 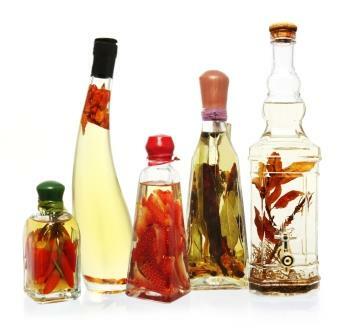 Vinegars may lend themselves to using a blend of herbs, for example oregano and basil together – think of the combination from classic recipes and pair up. Vinegars will not need as long as oils and honey to infuse, so you could try as quickly as 24 hours later, and remove/leave any items infusing for a deeper rounder flavour. Then use in salad dressing for an extra punch of taste, in coleslaw or as part of a marinade for meat/fish and so on. Your infusions can be made in pretty jam jars, and sauce jars that you might otherwise have recycled – why not display them in your kitchen as part of your décor!